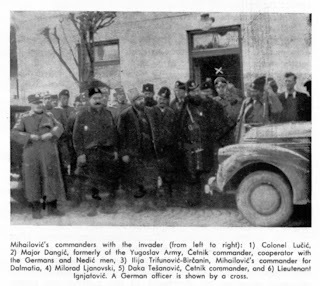 Mihailovich's commanders with the invader (from left to tight): 1) Colonel Lučić , 2) Major Dongić, formerly of the Yugoslav Army, Četnik commander, cooperator with the Germans and Nedić's men, 3) Ilija Trifunović-Birčanin, Mihailovć's commander for Dalmatia, 4) Milorad Ljanovski, 5) Daka Tešanović, Četnik commander, and 6) Lieutenant Ignjatović. A German officer is shown by a cross. Lie: Last fall Mihailovich kept as many as seven Nazi divisions chasing him through his Sumadija mountains. LIE: Mihailovich’s swarming raiders have preserved an “Island of Freedom”, which for a time was 20,000 square miles in area, with a population of 4,000,000. LIE: Mihailovich’s example has kept all Yugoslavia in a wild anti-Axis ferment. The Axis has resorted to executing untold thousands, but the revolt continues. 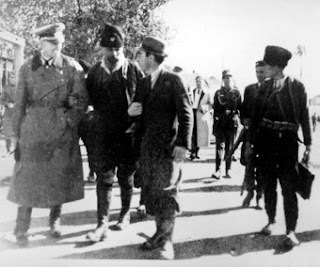 Last month the Nazis said they had seized Mihailo-vich’s wife, two sons and daughter, threatened to execute all relatives of Mihailovich’s army and 16,000 hostages if the General did not surrender within five days. LIE: Last October the Nazis even asked for peace. Amazingly stupid! Your ignorance is truely astounding. You didnt give a single reference to any facts. The fact is that even in America, you will read the truth about the airmen saved by the Serbs. Why not simply ask the airmen that are alive today? There are statues in the USA of Draza Mihailovic! Read about Operation Halyard: http://en.wikipedia.org/wiki/Operation_Halyard You cannot simply revise history idiot! Albanians formed Pro Nazi SS Divisions as did the Croats and Bosnians. The Serbian Cetniks(Royalists) and Partizans(Communists including both Serbs and Croats) were one of the only groups that fought Nazi's even after occupation while the rest of Europe lied down and accepted defeat. Wohooo... 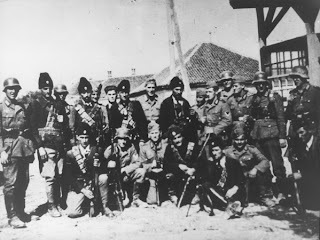 I mean really when you see pictures, documents, dates, ammunition orders and similar you are still claiming : "You didn't give a single reference to any facts"
Once for all learn that Serbian Cetniks was quisling group who fight back to back with Nazis (Germans, Italians, Ustashe and many more).